With winter melting away, many of us are looking for lighter meals that fit with springtime appetites (and pre-summer diets). This is a gorgeous, tasty preparation – introducing your local market’s spring vegetables, as well as adding warm flavors to beat the chill that lingers in the air. It has the low-fat and flavorful benefits of poaching seafood and using the liquid for seasoning. It also incorporates a simple technique called “monter au beurre,” which involves whisking a small amount of butter into the broth at the last minute, producing a classic, satisfying velvety finish. 1. Heat the oil over medium in a large, heavy stock pot. Add the leek and garlic and cook until tender. 2. Add the wine and broth, and bring the mixture to a simmer. Stir in the shrimp and scallops, and bring quickly to a boil. Immediately reduce heat, and simmer for around 3 minutes, or until shrimp are done. 3. 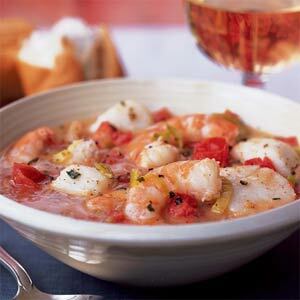 Remove the shrimp and scallops from the pot using a slotted spoon, and keep them warm on the side. Bring the broth mixture to a boil again, and allow to cook for 4 minutes. Reduce the heat to low, and add the butter, stirring constantly with a wire whisk until the butter is melted and a satiny sheen appears on the surface of the soup. 4. Stir in the chopped tomatoes and remaining ingredients. Taste and adjust the seasonings. 5. Divide the seafood among 4 bowls, and cover with broth. Serve immediately. This goes beautifully with light, crusty French bread and a glass of rose; try serving it with a plate of steamed, chilled crudite: fresh asparagus, green beans, spring carrots and broccoli, with a small side of garlic aioli.